The beach in Jumeirah is a long stretch of fine sand, stretching over several km to the southwest of the city of Dubai. Only small parts of this beach are publicly accessible, as the beach is mostly privately owned. Shown in this gallery are photos of the beach stretch to the west of the Burj al Arab hotel. 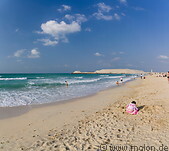 The sea water in Jumeirah beach is very clean and the beach is very pleasant in the winter months.